An exhibition looks at the bits and pieces that made up some of the great artwork of Californian artist Jess. The invention of collage as a medium of fine art early in the last century has been described as a “pasted-paper revolution,” an unprecedented way for artists to square the representational fictions of depiction with a newly emphatic sense of the literal presence of the picture surface (later to be known as “the materiality of the signifier”). When the California artist Jess (born Burgess Collins in 1923) made the first of what he called his “Paste-Ups” in 1951, however, it seems as though he was less inspired by his artistic forebears in Cubism and Dada than by the humble, unassuming crafts associated with making scrapbooks and other such memorabilia, twee pastimes cultivated by ladies whose sensibilities were formed during long Victorian afternoons: “I used to paste things up with my aunt,” the artist would later recall, “and that experience is probably more central to my love of this kind of art than the modern development of collage.” But he soon enough immersed himself in the latter. The following year his life partner, the poet Robert Duncan, bought him a copy of Max Ernst’s legendary Surrealist collage-novel Une Semaine de Bonté (1934), and he devoted himself to “absorbing” it. Part of what Jess had to absorb from Ernst, probably, was the fact that something akin to his disregard for the distinction between the innovative strategies of the Modernist avant-gardes and the cozy diversions of the nineteenth-century bourgeoisie was something the Modernists were already secretly onto; after all, if Ernst was able to make his collages from the engravings illustrating forgotten Victorian novels, this was in good part because the melodrama so characteristic of them was already imbued with the “omnipotence of dream” that the Surrealists and Dadas saw as potentially subversive of bourgeois reason. So when Jess defiantly referred to himself as “insistently a Romantic artist,” he was far from rejecting the art movements of his own century; he was articulating his understanding of their significance. That an artistic vocation was synonymous with a choice to opt out of a dominant sense of reason was an idea even more vivid in Jess’s mind than in that of most other artists because, unlike them, he knew from the inside what Eisenhower would soon call the military-industrial complex and Allen Ginsberg simply referred to as Moloch. Having trained as a chemist, he’d gone to work first for the Manhattan Project and then the Hanford Atomic Energy Project in Richland, Washington, on the production of plutonium. After experiencing a terrifying dream of the world’s destruction, he abandoned his scientific career in 1949 and enrolled in the California School of Fine Arts–now the San Francisco Art Institute–where he studied with such Abstract Expressionist painters as Clyfford Still and Edward Corbett. The sense of nuclear threat would be recurrent in his art, above all in the ’50s. The year 1949 was also when Jess first encountered Duncan–already notorious for his outspoken 1944 essay “The Homosexual in Society”–and on New Year’s Day, 1951, they exchanged the vows that would unite them until the poet’s death in 1988. Whatever it was Jess learned from his teachers, he doesn’t seem to have been able to put it to much immediate use; his paintings of the ’50s suggest that he never had enough facility with paint to use it as a vehicle for spontaneous gesture or pure color. Later he would frankly suggest that ham-handedness was precisely what led him to concentrate on collage: “I didn’t start out as a child or young man to develop skills with the hand and eye. When I was twenty-eight and becoming an artist, I no longer had the ability to learn these things,” he explained. “What my mind wanted to see happen would require skills I could not possibly use. Therefore, I had to use images that had already been made for me.” But the supernatural finesse with which Jess handled his cutting tools shows that what was at stake was not a lack of manual skill but rather a difference in kind of skill. 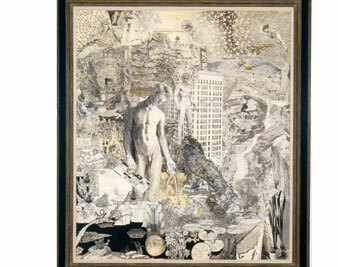 His collages can be immensely detailed and (unlike those of Ernst in Une Semaine de Bonté, for instance) are not typically constructed by adding just a few heterogeneous elements to an already existing pictorial setting; instead, the collage is an accretion of multitudinous small parts, each representational in itself, that combine to create a new space that may be essentially abstract–a “flux-image” as Jess sometimes called it. This calls for great precision of hand and eye, but in a different way than painting does. In a famous passage the philosopher Maurice Merleau-Ponty describes a film of Matisse at work; in slow motion, “that same brush that, seen with the naked eye, leaped from one act to another, was seen…to try ten possible movements, dance in front of the canvas, brush it lightly several times, and crash down finally like a lightning stroke upon the one line necessary.” The “solemn, expanded time” lent to the mercurial act of painting by the artifice of slow-motion playback is the real time of the collagist’s working methods–at least when the collagist is one like Jess rather than the more spontaneous Ernst, who executed Une Semaine de Bonté at a rate of ten collages a day, 200 pages in a mere three weeks. Jess, by contrast, tended to meditate on his collages over long periods, archiving images over the years, working out compositions in drawing, and gradually piecing his images together by holding them in place with pins until he was sure they were ready to be glued down. Perhaps a super-sped-up time-lapse film of Jess at work would have split the difference between him and the Modernist painter par excellence, summarizing what might have been, likewise, ten possible choices in the placement of an image in a single complicated but decisive feint of the hand. No, Jess may never have been able to become a good painter in any way envisaged by his art school training, but in retrospect any notion that his choice of collage as a primary medium was determined by some deficiency of the hand should be dismissed as merely anecdotal. His use of already existing images was never really a stopgap, a shortcut to some other end–nearly immediately, it became the conceptual basis for his entire sense of what art is, and eventually it allowed him to reinvent painting for himself on a very different basis from what he had been taught. Thus the weight he began to give to the notion of translation, and not only in the thirty-two paintings he designated as translations between 1959 and 1976. Only two of these are included in the exhibition “Jess: To and From the Printed Page,” developed by Independent Curators International and curated by Ingrid Schaffner, which has been touring the country since March 2007. (I saw it at the Harry Ransom Humanities Research Center at the University of Texas at Austin; the show is currently on view at the Douglas F. Cooley Memorial Art Gallery, Reed College, Portland, Oregon, through June 17, and will then move to the University of Iowa Museum of Art, Iowa City, September 12-November 9, and the Cornell Fine Arts Museum, Rollins College, Winter Park, Florida, January 22-March 21, 2009.) This is a shame because it means the show–the first large-scale presentation of Jess’s work since his death in 2004–gives a skewed sense of the overall shape of the artist’s career, and even shortchanges the exhibition’s announced theme, his work’s relation to print culture, since the “Translations” are usually in the first instance translations of found illustrations or postcards into paint–lots of paint. In these paintings, Jess abandoned all semblance of the free, untrammeled gesturalism that he might have imbibed from his teachers, and that was still a factor in his nebulously representational paintings of the mid-’50s. The “Translations,” by contrast, are not so much painted as sculpted in paint–thick, congealed, churned-up eddies of color far more obdurate and crude than the impastos of earlier painters, with nothing of van Gogh’s expressiveness, let alone Rembrandt’s numinous dialectic of light and base matter. Jess’s way with paint is instead surprisingly akin to the facture developed around the same time by another maverick, the New York-based Alfred Jensen, for his geometrically patterned explorations of numerical systems derived from Pythagorean esotericism, the Mayan calendar, Goethe’s color theory and other such disreputable sources. Both artists alienate oil paint from its traditional humanist purpose, best summed up in Willem de Kooning’s assertion that “flesh was the reason oil painting was invented.” Few artists have ever put the physicality of oil paint to less fleshly use than Jess and Jensen. But otherwise, the effects the two achieve with it are quite different: whereas the materiality of Jensen’s paint lends his abstract patterns a startling concreteness, in Jess’s “Translations” and other paintings with similar technique, the paint seems to embalm the imagery, giving even the most anodyne motifs (like the personal snapshot he used in one example in the exhibition, Fig. 3–Ida, Duncan, and I: Translation #18, 1966) an eerie, haunted air, as well as an intransigent weight and power that no collage could ever attain. If the exhibition disappoints by slighting Jess the painter, it amply fulfills its ambition to show his art’s roots, not just in the “printed page” exemplified by the illustrations he sliced and diced to get material for his paste-ups or by the countless books, little magazines and broadsides for which so many of them were made and whose presence lends the exhibition a seductively insiderish tone, in accordance with recent tendencies to value a “poetics of coterie” in the face of an ever more overwhelming culture industry. The exhibition also identifies him more broadly as a creature of literary culture, steeped in “the fairytale writings of George MacDonald, the Puritan gothic of Nathaniel Hawthorne, the science fiction of J.U. Lloyd (a pharmacist who set stories in a land called ‘Etidorhpa,’ or ‘Aphrodite’ spelled backwards), the mystical Chronicles of C.S. Lewis and J.R.R. Tolkien, and the supernatural thrillers of Charles Williams,” as Schaffner lists them, and Finnegans Wake, which Jess read incessantly. And it recognizes his place in a poetic avant-garde alongside Duncan and such friends and rivals as Denise Levertov, James Broughton and Jack Spicer–not to mention the anomalous figure who perhaps bridged these two worlds, the Scottish-born Helen Adam. The godmother of the San Francisco Renaissance, as she’s been called, specialized in gruesome ballads that sound as if they were centuries old. Jess himself produced a small but estimable body of poetry, recordings of which can be heard in the exhibition, and again, translation is at its core, most obviously in his free renderings of Christian Morgenstern’s Gallowsongs (1970). In this milieu, it was natural for artists to write poetry and for poets to make films and for everyone to start ephemeral presses, magazines and theaters. Yet the emphasis on the literary basis of Jess’s art should not be taken to mean that his works have determinate discursive meanings: he translated images into other images, not texts into images. Looking at any of his elaborate and meticulously composed collages, with their recurrent evocation of myths, fairy tales and Jungian archetypes, it’s easy to get the feeling that there is some specific coded message to be extracted from it; these works would be a feast for paranoiacs. Yet the more one delves into them the more one realizes that, in good Modernist style, their elaborate structure is its own greatest reward. A deeper acquaintance with the works of J.U. Lloyd or even James Joyce is probably not going to provide the key that unlocks their secrets. It is undoubtedly true that, as Schaffner writes, “the archetypal story for Jess was one of an innocent’s wanderings, or fall, into realms of the imagination, the metaphysical, outer space, or the unconscious”–but this fall or wandering is therefore one away from definable meaning into a realm of indeterminate and unverifiable echoes, resonances and correspondences. “Jess who most loves the truth of nonsense,” as Duncan once said, was never likely to furnish his works with didactic meaning. Except for a last bout of effort on Narkissos between 1989 and 1991, Jess’s work as an artist mostly ended when Duncan suffered kidney failure in 1984 and Jess took over his lover’s care until his death. Since then, his work has been mainly a sort of persistent rumor. As Schaffner admits, “Jess’s reputation remains marginal,” his following “limited, if devoted.” To some extent this peripheral but persistent position might be just what Jess would have wanted. His art seeks a cult status that would be undermined by becoming too familiar. But from the fairy-tale evocations of Karen Kilimnik’s paintings and Anna Gaskell’s photographs to the fantastical narratives in the drawings of Ernesto Caivano or Zak Smith, the current scene is overflowing with artists trying to make an end-run around the mainstream of Modernism to integrate vernacular imagery with idiosyncratic visions and reclaim something like Victorian feyness, literary bewitchment and, yes, nonsense. Jess could have been one of their guides, if only they were more aware of him. Placing him so firmly within his context, “Jess: To and From the Printed Page” makes me wonder if it doesn’t keep him further from our own than he should be.